This year in honor of Accretionary Wedge #40 I carved my Halloween pumpkin into a mountain range. In keeping with the Laramide-style deformation that surrounds us, it is a breached anticline with the Precambrian core exposed. 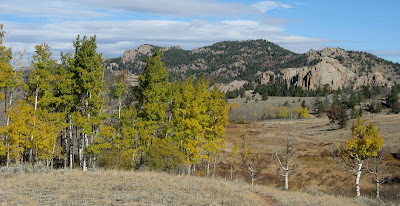 Peaked flatirons ring the strike valley that surrounds the highest parts of the range. Clastic debris litters the basal slopes. Periglaciologist Barbie? ... no, Fred! ... Fred the Periglaciologist! Living where he does, his is a profession of choice. Periglacial sand wedge, southeast Wyoming. Fred is in his eureka pose, having just come across a spectacular exposure of sand wedges in a ditch in the west part of town. “Sand wedge” is a misnomer; fill material is not restricted to sand -- it can be finer or coarser. The name is used to differentiate these wedges from ice wedges, which form in wet environments. 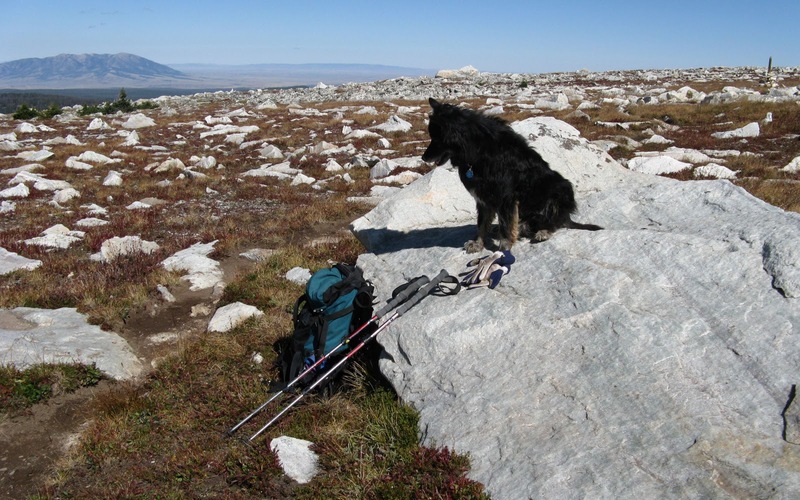 These that Fred found are relics of cold dry Pleistocene times when there was permafrost in the Wyoming basins. 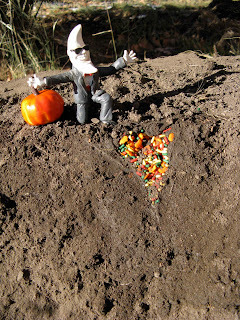 Thermal-contraction cracks filled up with whatever blew in -- loess, sand, miscellaneous debris. I am a field botanist currently working in a field of uncertainty -- vegetation characterization, mapping and conservation. 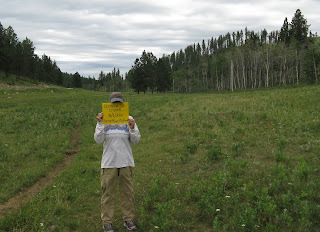 What vegetation type am I standing in? Is it within the natural range of variation? How resilient is it to human use? Al agonizes over what name to put on the form. After years of experience I know that when I use a vegetation map I may not find on the ground what is promised by the map, for I'm looking at an attempt to find discrete units in a continuous landscape, driven by the requirements of a contract. I know that an assessment of human impacts on vegetation may be based mainly on the author's biases, sources of funding and need to publish. But in addition to these more mundane factors, there is the intense irresistible human craving for pattern, explanation and predictability in an unknown world. Messy and secretive Mother Nature doesn't always cooperate. Hollis hopes no one will ask her any more questions. Geology must have such fields of uncertainty, especially with regards to things far in the past or far below the surface. This always crosses my mind when reading articles and blogs with high wow-values ... the Himalayas stacking up when India pushes against Asia, like the wedges of snow ahead of my shovel on the sidewalk; or the pieces of ancient continents that were stuck onto the Wyoming craton almost two billion years ago (right here under my house! ); or plate tectonics leading to magnetic reversals and even Great Extinctions; or a totally frozen earth before the Cambrian. "Wow! How do they know these things?!" I ask. So when The Great Snowball Fight popped up on my blog list last night I went there immediately, motivated also by the pleasure I always find in reading earth-literally’s posts, wonderful examples of the beautiful mystical thoughts that geology inspires by looking deep into the unknown. After an ethereal account of field work in the wilds of the Sultanate of Oman, laced with something of a Rubáiyát flavor (surely the field crew shared bread and wine under the date palms those evenings in the Wilderness), e-l returns to the real world and the Great Snowball Fight. Was the earth completely frozen for millions of years prior to the Cambrian? Is that what the evidence tells us? That is what some people hear it say. Others are sure that conditions cycled through cold and warm during that period, as they have more recently. How many scientists working in fields of uncertainty add “but we don’t really know ... ", “but we’re assuming that ....” to their descriptions and discussions? I found myself saying this repeatedly to my field crew last summer, to the agency staff overseeing the project, to myself. It seems critical to acknowledge limits of what we can perceive and say, even as we suggest what might be the case. Interestingly, maybe not surprisingly, these admonitions did not seem to sink in. We prefer explanations, answers. And I’m not immune. 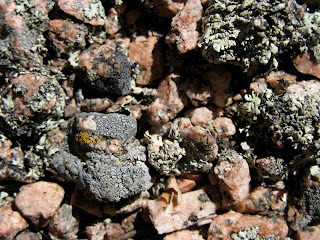 I look at rocks at 11,000 feet above sea level in the Snowy Range "knowing” that they are from beaches and reefs that were here over a billion years ago ... that this was a nice warm place on the ocean a really long time ago. It’s irresistible. The time scale of this story pushes it into a world of mystical and fantastic things, a wonderful state of mind that I can’t resist. Sparky sun-bathing on the remains of a Precambrian beach. 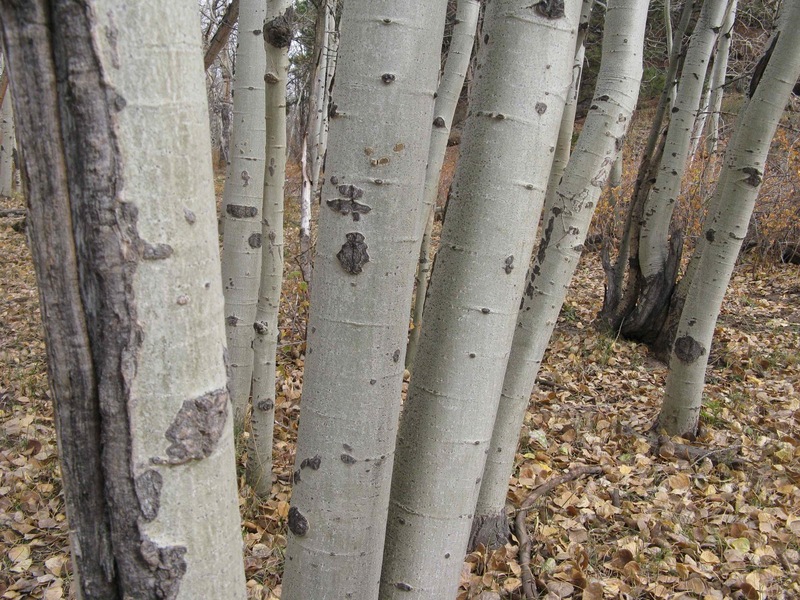 Aspen, Granite III -- the last? 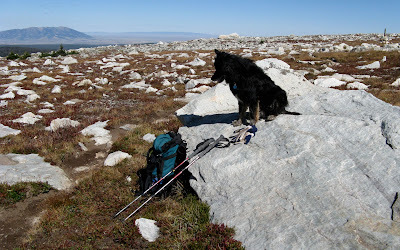 Another hike in the mountains east of town. Fall is a beautiful time with its low light and stillness, but it constantly reminds that change is imminent, that this will soon be gone. The weatherman says the same -- by Thursday we will have had temperatures in the single digits (F). dead leaves cover the ground. another winter makes its way. Not everyone is bothered ... carefree Sparky wriggles happily in the dead leaves. 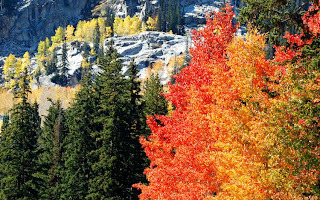 A few weeks ago I took a wonderful Indian Summer hike through quaking aspen and Sherman granite in the mountains east of town. But the next day was wintry, bringing the first snow of the season which lasted all day leaving 6” of wet concrete on my picnic table. A week later, I headed back up into the mountains to check on the aspen. Wow! .. many still had their leaves. 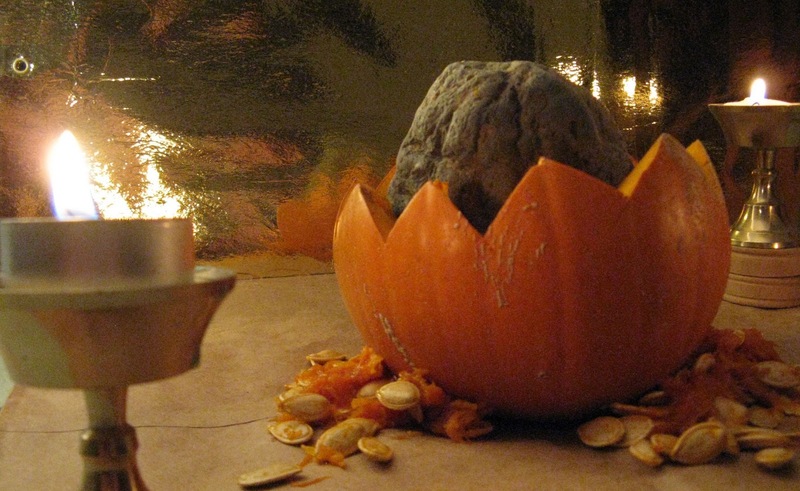 It isn't yet the end of Indian Summer, and we are all grateful. 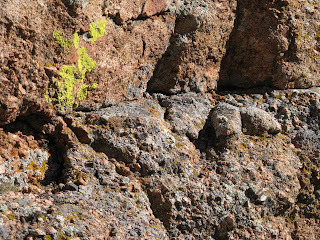 In one warm sunny spot below the south face of a massive outcrop of Sherman granite, the trees were still in their green summer garb. 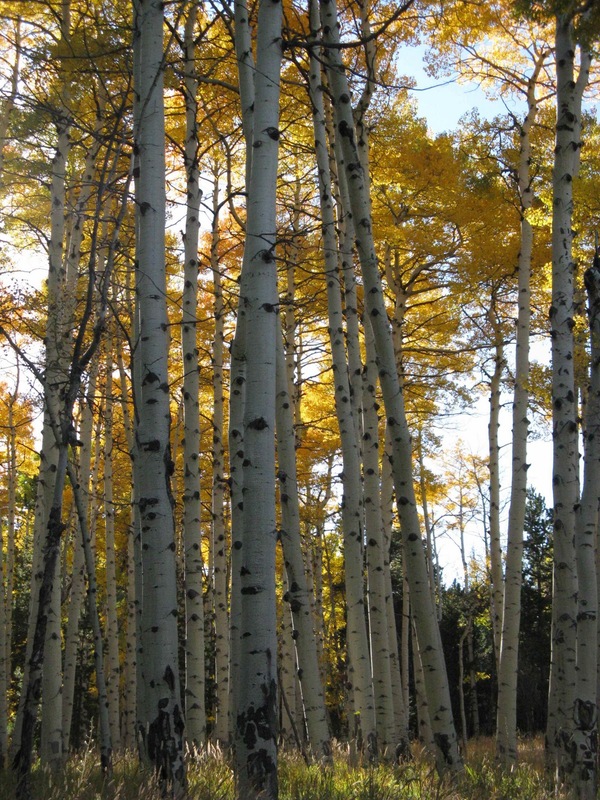 Some aspen were sporting a few orange leaves ... maybe they made enough sugars during our warm fall days to produce some anthocyanins. Or maybe it really was the Leaf Fairies, the ones who go out on frosty nights and paint over dying leaves with these lovely colors. 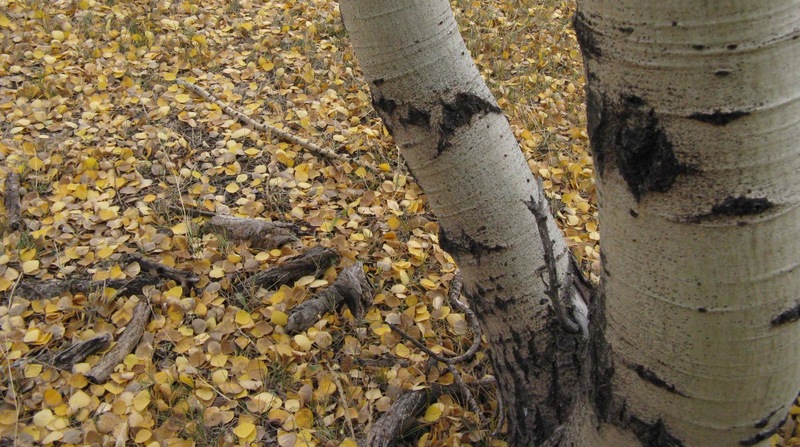 Earth Science Picture of the Day has had a rash of plant photos lately, including a beautiful shot by Nel Graham of yellow- and oranged-leaved aspen in the eastern Sierra Nevada. 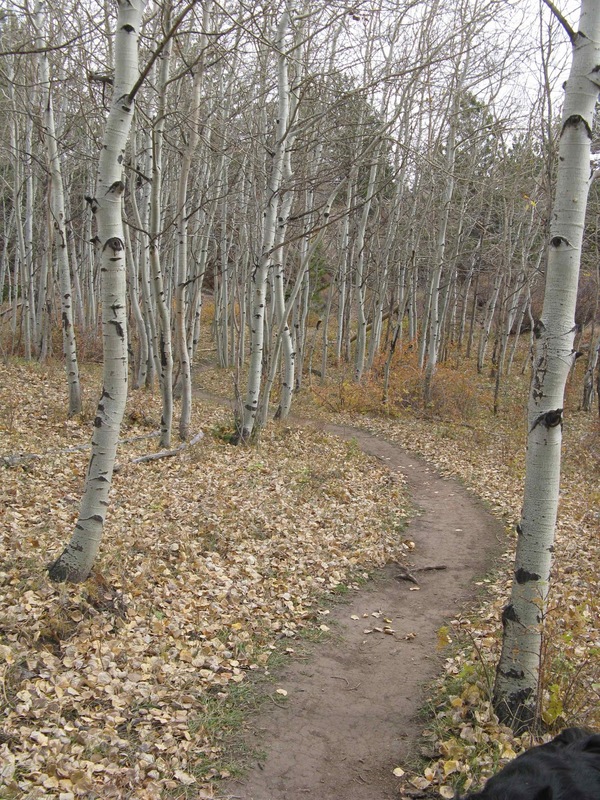 From there a link leads to a 2010 ESPD of a really spectacular mix of leaf colors in Utah aspen (left). Fall colors are not limited to trees. Around a bend in the trail I found alum root basking in the sunshine, its autumn leaves backlit by the low autumn light. 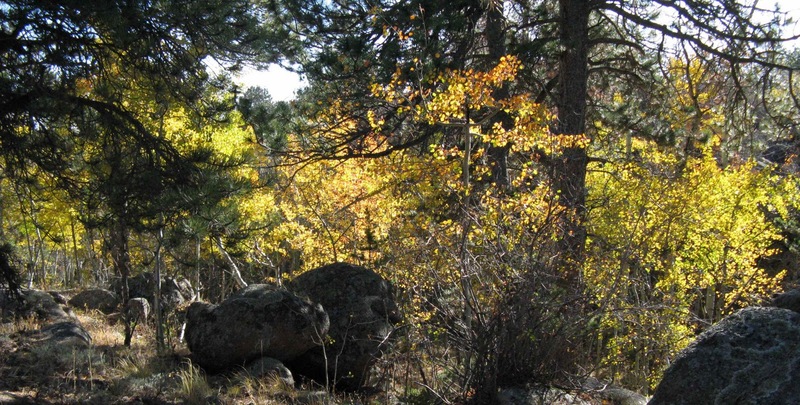 Several weeks ago, Uncovered Earth wrote about the inconvenience of vegetation to geologists. 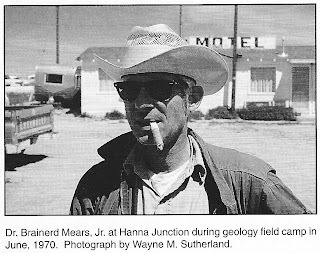 That post brought back wonderful memories and prompted me to write about my geology mentor, Dr. Brainerd “Nip” Mears, Jr., now-retired professor of geology at the University of Wyoming. 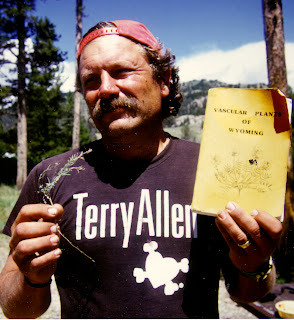 As a Botany grad student studying plant geography, I was encouraged to take his Regional Geomorphology course. 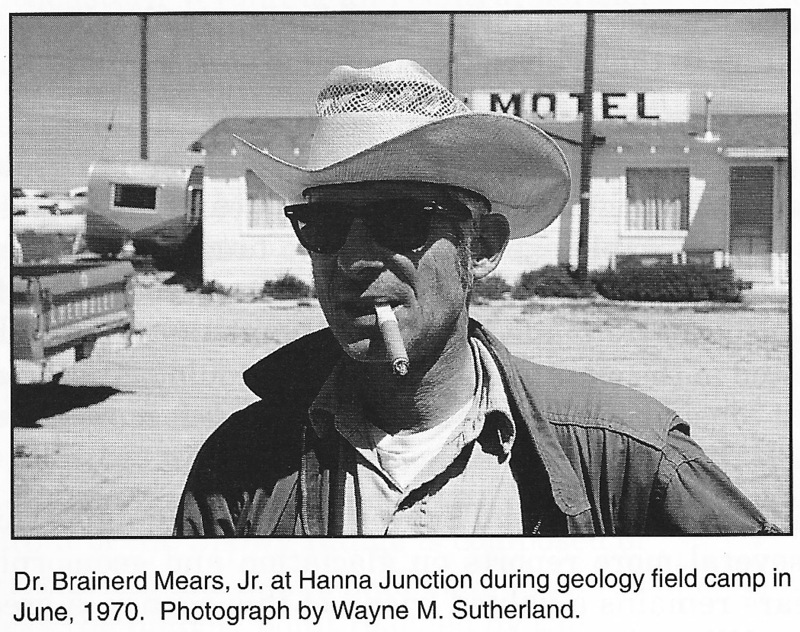 I fell in love with the subject and went on to take graduate courses with Dr. Mears. We field-tripped around Wyoming, marveling at our landscapes with the help of our professor’s clear explanations and wonderful, quirky and very dry sense of humor. Those experiences have paid off again and again in terms of enjoying the world around me. That’s how I was introduced to the inconvenience of vegetation. 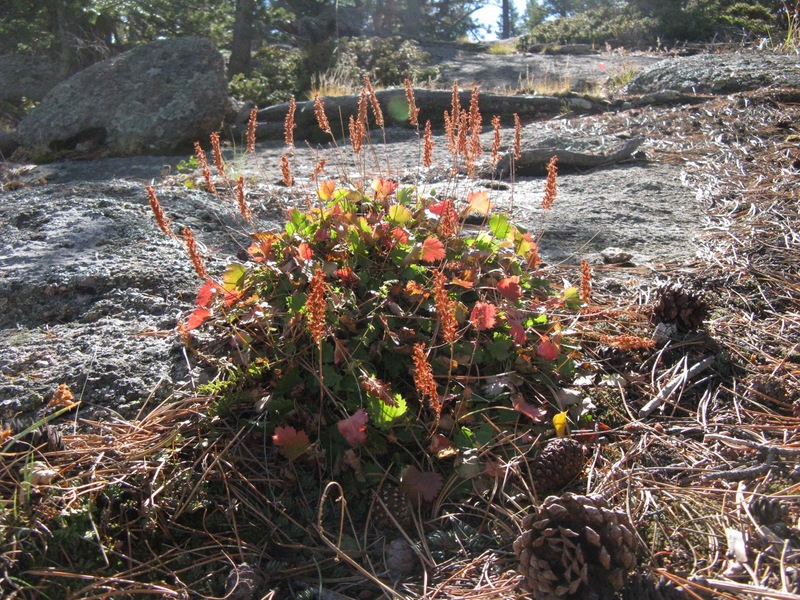 Today’s post follows the overall theme of my blog -- plants and rocks -- which I chose because I can’t decide which I am at heart, a botanist or a geologist. Last week I headed to the crest of the southern Laramie Range to enjoy another Indian Summer day, hoping to capture the glowing yellow aspen leaves with my point-and-shoot camera. 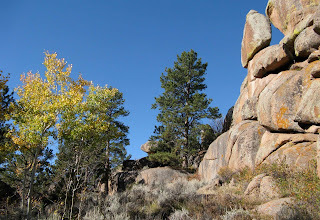 It’s fall and already the sun is low enough to make things sparkle -- leaves on trees, crystals in rocks. 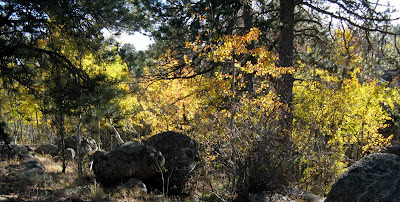 But capturing glowing yellow leaves back-lit by the sun is not easy. I think my camera’s auto exposure function doesn’t deal well with back-lighting. 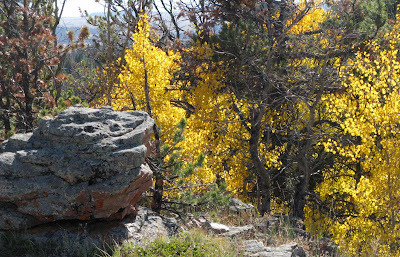 Sherman granite on left; yellow (and some green) quaking aspen in distance. The Sherman batholith was emplaced ca 1.4 billion years ago, one of the many granite plutons of that age in southeast Wyoming, Colorado, New Mexico and Arizona ... but not further north. 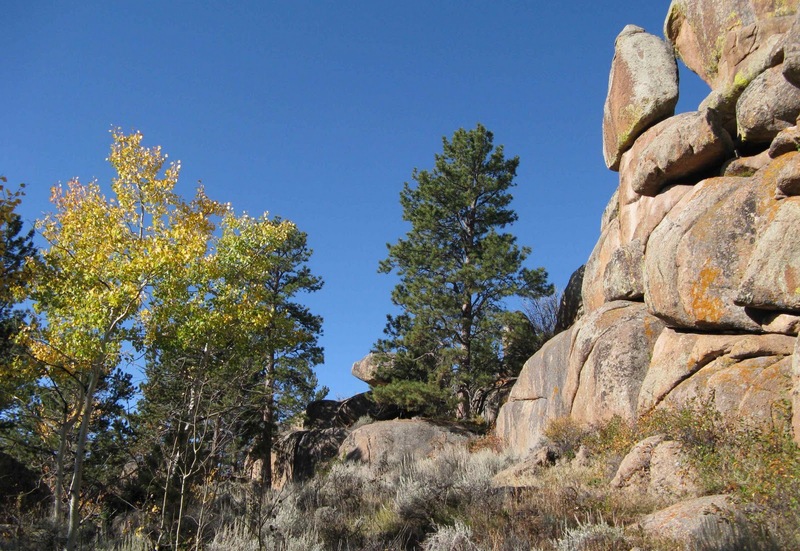 This must have something to do with the Cheyenne belt, our local suture zone where arcs or microterranes were added to the south margin of Laurentia 1.9 to 1.6 billion years ago. 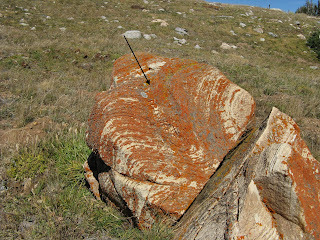 The Wyoming craton itself had merged with Laurentia just a few hundred million years earlier (wow! how do they know all this stuff?!! ... I have so much to learn). 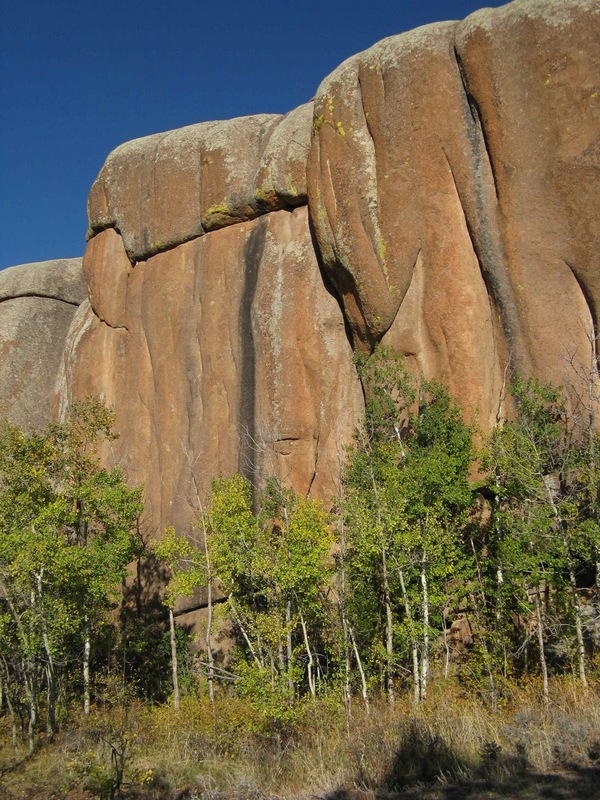 This granite is infamously coarse, just ask Vedauwoo rock climbers. Grus, to ca 0.5 cm diameter ... with lichen. The granite weathers to grus -- “accumulation of angular, coarse-grained fragments (sand and gravel) resulting from the granular disintegration of crystalline rocks (most notably granitoids) generally in arid or semiarid regions” (Bates and Jackson, Dictionary of Geological Terms). Spectacular washboard topography develops on the unpaved roads each season, I suspect because grus doesn’t compact, is easily moved. Locals disagree on to how to drive -- creep along to maximize control vs. drive at 30 mph to smooth out effects of the bumps. 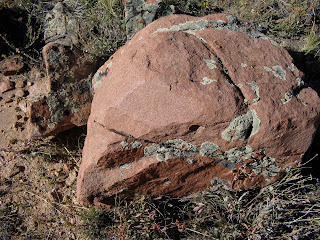 Not all the granite in this area is coarse; occasionally there is a fine-grained reddish type for which I’ve yet to find an explanation or reference ... sorry, you’ll have to wait for the next exciting episode. 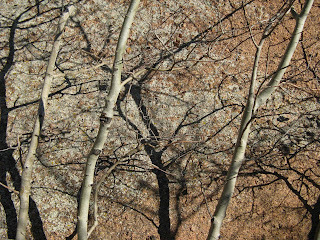 This looks like yet another photo of a rock, but turn your attention please to the bright yellow leaves behind -- backlit quaking aspen. Why are they no longer green? Steady lengthening of nights triggers the shut-down of (green) chlorophyll production, allowing the yellow carotenoid and reddish anthocyanin pigments their days in the sun. 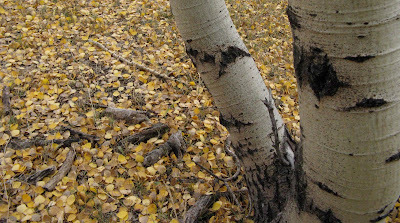 Carotenoids are always present, so the yellows are predictable. 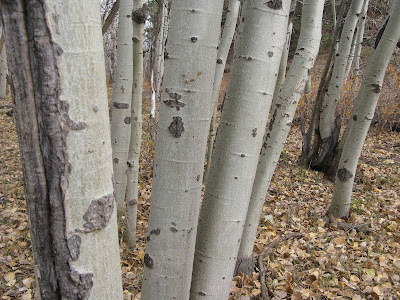 Anthocyanins are produced in the fall, dependent on amount of sugar in the leaves. 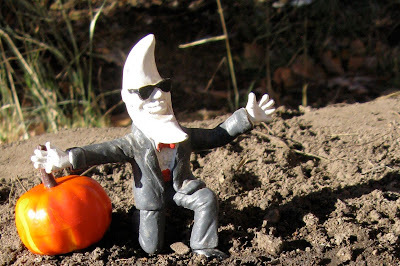 Warm sunny days with cool but not freezing nights maximize sugar production and red to crimson colors. 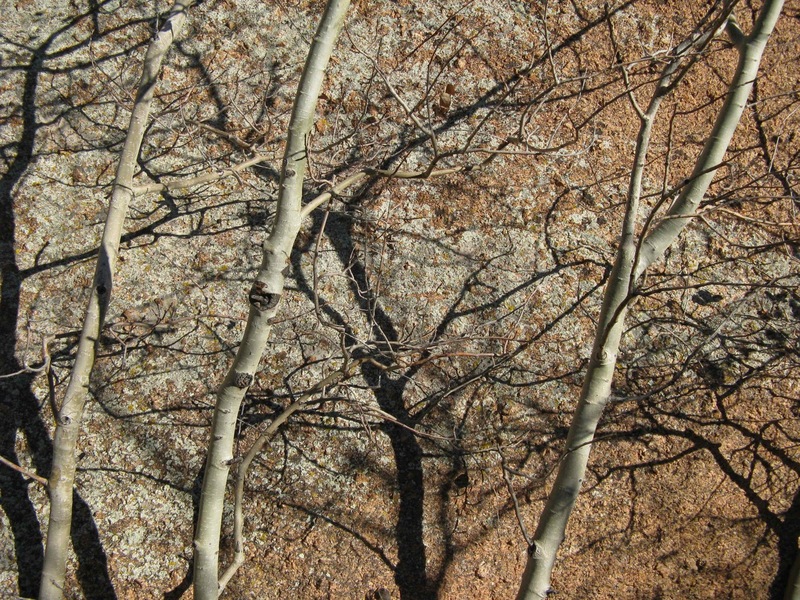 We don’t have much in the way of red leaves here, but occasionally our aspen turn orange. 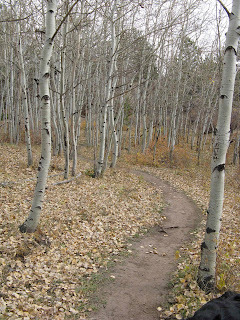 I hiked down into the Enchanted Forest with its large quaking aspen. There was the soft sound of leaves fluttering in the wind, but somehow this place always seems very still. If I’m ever going to see the Buddha, I think it will be here. 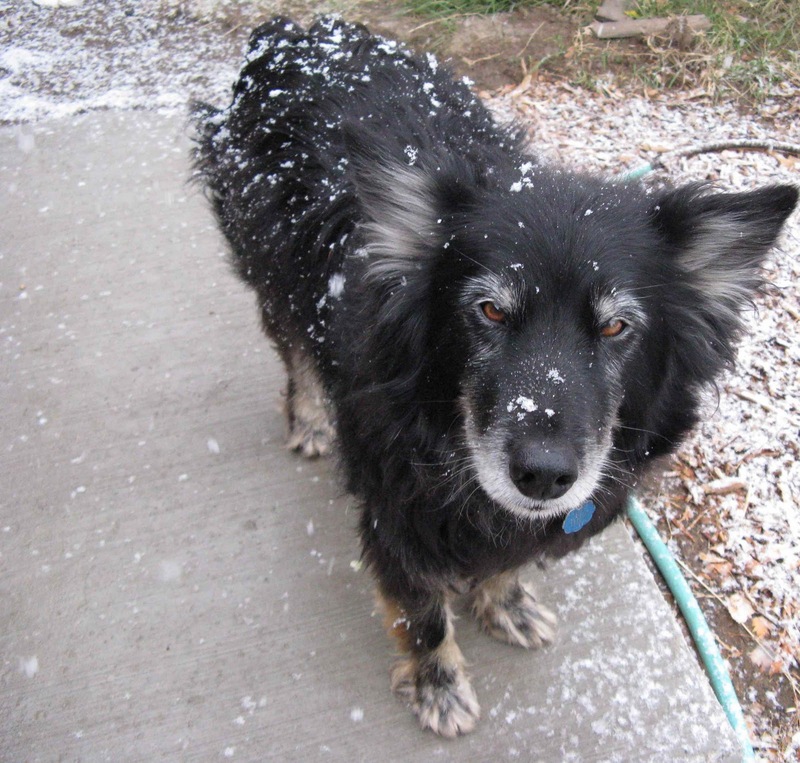 This morning, Looking for Detachment posted on the First Snow of 2011 near Austin somewhere in Nevada. 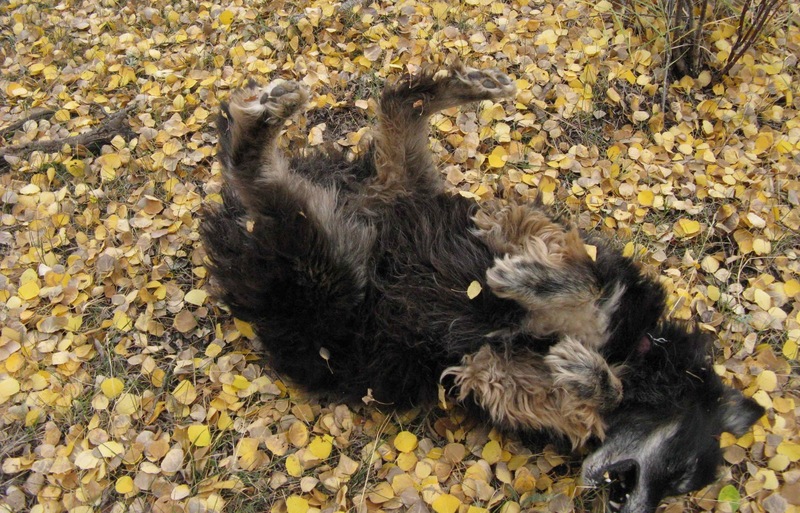 Now, a few hours later, the first flakes of the season are falling in Laramie, Wyoming. 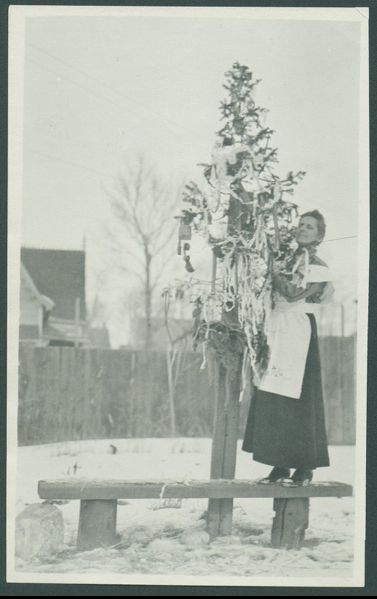 First Snow is a popular topic here, and probably everywhere with real winters. Ours is late this year, “it always snows sometime in September” or at least by early October or maybe this isn’t so late after all. Such is the nature of our weather, variable on a scale that makes it difficult to see real patterns, tempted instead by pareidolia, our propensity to see patterns that aren't really there. Thankfully we have folks collecting data! But we know the winters used to be much worse ... 'cause that’s what the old-timers always tell us. 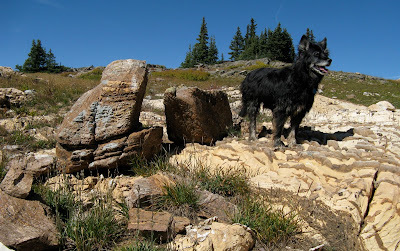 It’s a crisp but glorious Indian Summer day in the Holocene Epoch, and Sparky is standing next to Precambrian stromatolites ... the fossilized remains of a 1.7 billion-year old mat of cyanobacteria (aka blue-green algae) that grew in a warm shallow sea. This is what I love about geology, the opportunity to look far into the past and unravel a tiny bit of the surprising mysteries around us. Uncovered Earth said it so well when he wrote: “To appreciate a thing, you must first come to know it”. 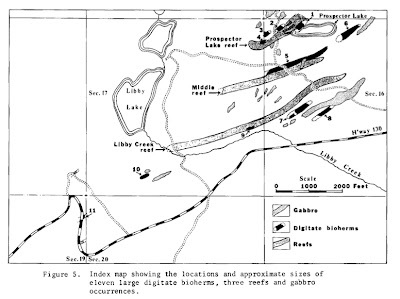 For my knowledge and appreciation of the stromatolites of the Nash Formation, I thank one of the great legends of Wyoming geology, Dr. Samuel H. Knight. 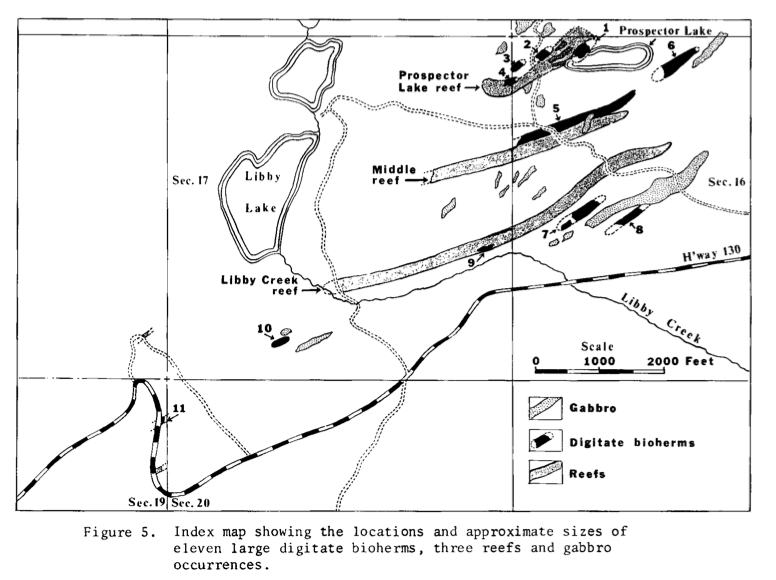 It was because of his “Precambrian stromatolites, bioherms and reefs in the lower half of the Nash Formation, Medicine Bow Mountains” (1968) that Sparky and I were able to hike along Precambrian reefs, for Doc Knight had drawn a detailed map of reef locations (click to view). 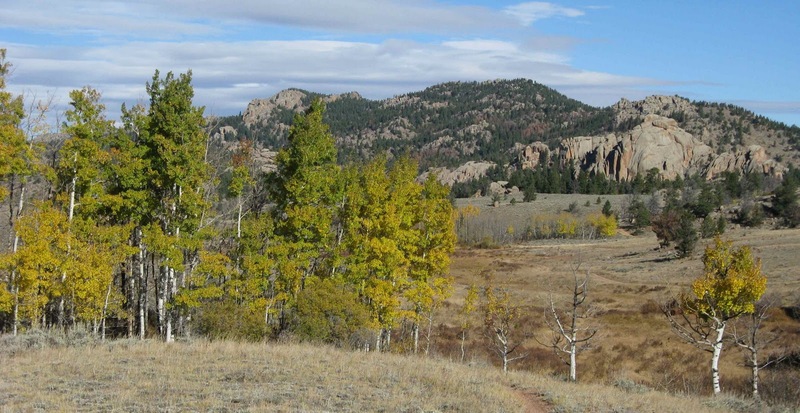 The early Proterozoic metasedimentary formations of the Medicine Bow Mountains, including the stromatolitic Nash Formation, were steeply folded ca 1.8 billion years ago, a time of terrane or arc accretion along the Cheyenne belt (suture zone) in southeast Wyoming. The near-vertical orientation of these strata can be seen in this photo of the Snowy Range -- the highest peaks of the Med Bows. The bedding planes of the Medicine Peak quartzite form sheer faces below the ridge crest. 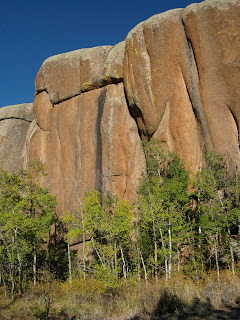 The quartzite is so resistant that cirques typical of alpine landscapes are absent. 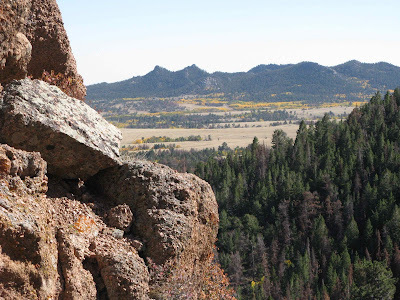 Instead there is a eight-mile-long ridge with 1000 feet of vertical relief. The stromatolitic Nash Formation also was severely deformed, but the rocks underwent only low-grade metamorphism, hence the wonderful preservation of stromatolites. 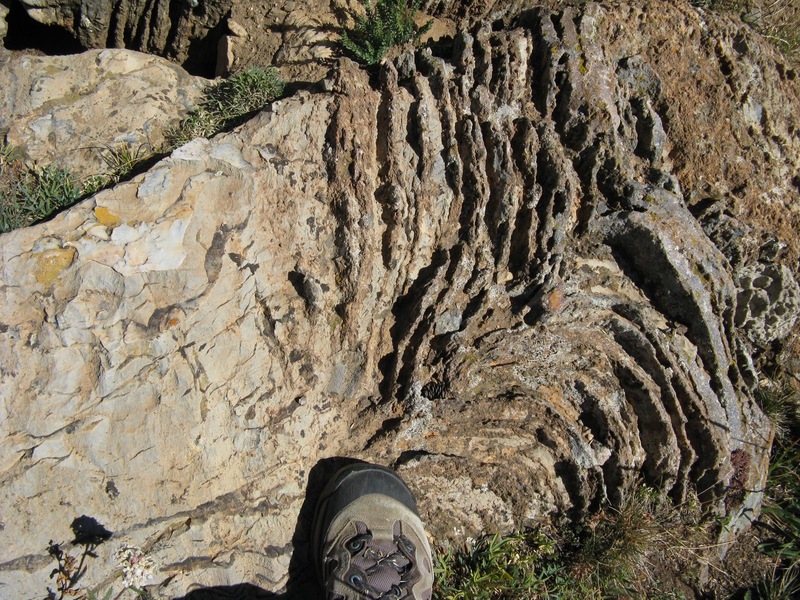 In spite of multiple episodes of uplift and folding, the original orientation of outcrops often can be determined from the stromatolites themselves. 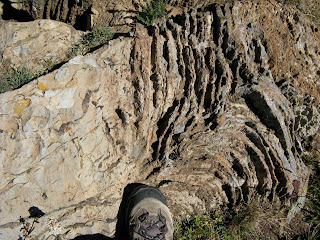 In the next photos, the V shapes (as well as the black arrow and shoe) point to the ground at time of formation (the Vs are gaps between adjacent algal mounds). The Nash Formation is crossed by sill-like masses of gabbro that had not been dated as of 1992. 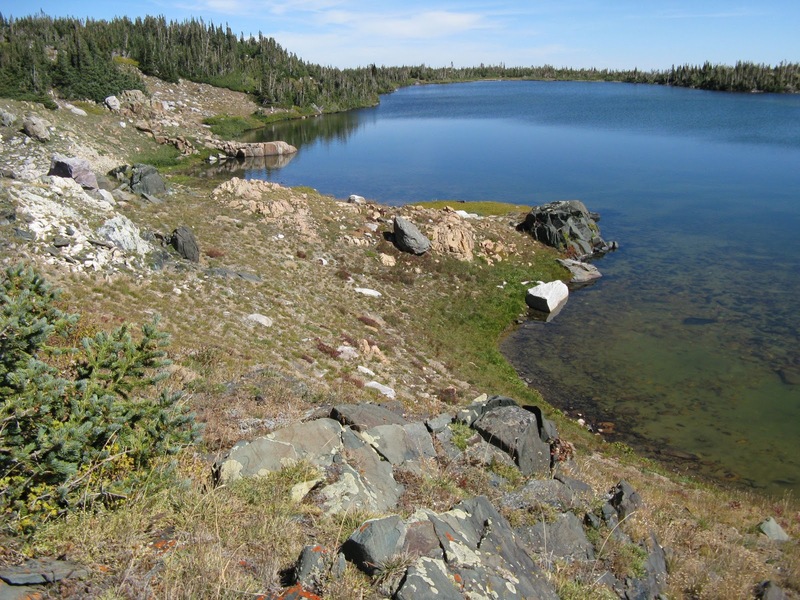 Gabbro intrusion in Nash Formation in foreground, with beautiful subalpine lake for scale.